Members of the Bedford High School 3D Animation team are, from left, Nick Regos, Lance Dague, Luke Dague Nathaniel Semanek, Camden Donahoe and Seth Montgomery. Architectural Design team members are, from left, Nicholas Regos, Morgan White, Brandon Fischer, Lance Dague, Nathaniel Semanek and Luke Dague. Transportation Modeling competitor Gannon Ziviello poses with his trophy. Bedford High School students excelled at the 2019 Technology Student Association (TSA) state conference, held April 10-13 at Seven Springs Resort. Twenty-three students competed in multiple events, with 18 placing in the Top 10 and 10 qualifying for the 2019 National TSA Conference, scheduled for June 28 to July 2 at the Gaylord Resort in National Harbor, Maryland. Bedford High School had three state champions in 3D Animation, Architectural Design and Transportation Modeling. Taking first place were the 3D Animation team of Lance Dague, Luke Dague, Camden Donahoe, Seth Montgomery, Nick Regos and Nathaniel Semanek; the Architectural Design team of Lance Dague, Luke Dague, Nathaniel Semanek Brandon Fischer, Nicholas Regos and Morgan White; and Transportation Modeling competitor Gannon Ziviello. The Computer Integrated Manufacturing team of Lance Dague, Luke Dague, Nathaniel Semanek Brandon Fischer and Andrew Foor took second place. Flight Endurance contestant Luke Dague capture fourth place, while Photographic Technology competitor Shana Andrews and Safety Illustration participant Harmony Fetterman both took fifth place honors. 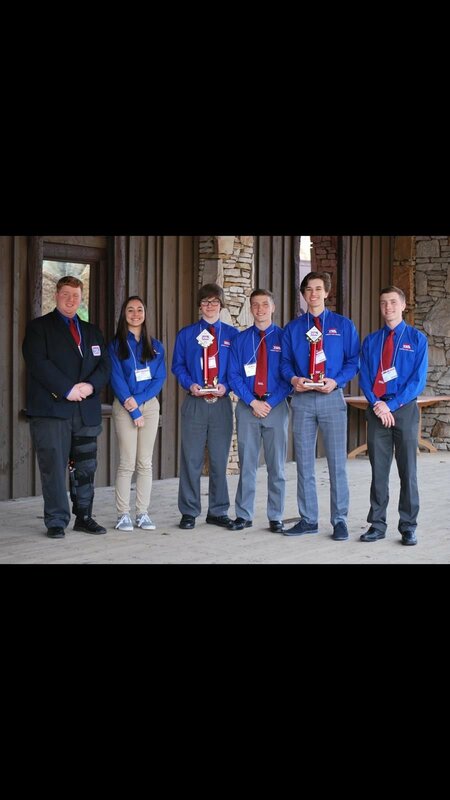 Taking sixth place was the Animatronics team of Nathaniel Semanek, Seth Montgomery, Brandon Fischer, Lance Dague and Luke Dague. Computer Aided Design Architecture competitor Gannon Ziviello finished in eighth place, while taking ninth place was the On Demand Video team of Shana Andrews, Gannon Ziviello, Silas Custer and Harmony Fetterman, and finishing in 10th place was Flight Endurance contestant Morgan White. The Pennsylvania Technology Student Association has a state wide conference at Seven Springs Resort every April. There were about 2,000 students competing in 35 events at the middle and high school levels under the guidance of 150 advisers from 140 schools throughout the state. Technology Student Association (TSA) has been an integral part of technology education programs across the country since 1979. Its mission is to promote leadership and personal growth for its members in a technologically advanced society. Students involved with TSA participate in activities that help prepare them for the future with rewarding careers and civic responsibility. TSA offers co-curricular educational programs, and competitions at regional, state, and national conferences. Anyone wishing to donate to the Technology Student Association to help defray the cost of the trip to nationals is asked to contact Douglas Pauley at Bedford High School, 623-4250. Mostly cloudy skies. High 78F. Winds S at 10 to 15 mph.. Partly cloudy skies early will give way to cloudy skies late. Low 61F. Winds S at 10 to 15 mph.